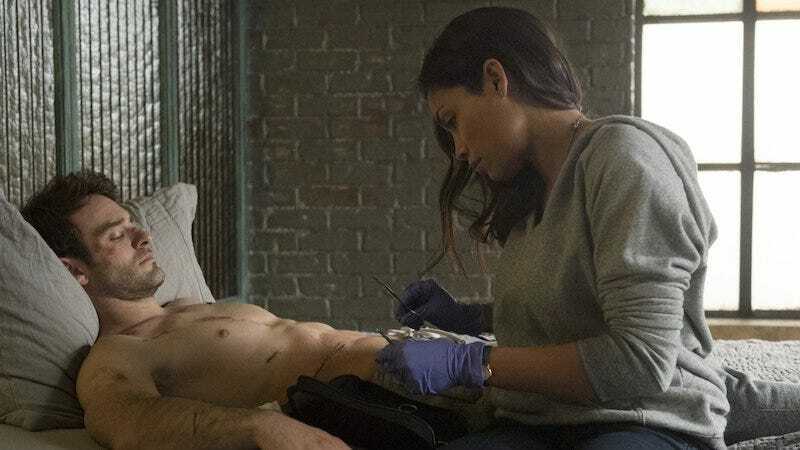 In Netflix and Marvel’s New York City, there is exactly one health professional that all superheroes go to: Claire Temple, played by Rosario Dawson. She’s pops up in each series, the thread that connected the shows together, reminding people they all take place in the same city. Except she won’t be doing it for The Punisher. At the end of the day, it’s really hard to get all of those casts together. For The Defenders, it was difficult to get everybody together. People are busy! There are so many times where I really want it to happen. I really wanted to do a cameo on The Punisher, but it doesn’t always work that way. It looks like we won’t see Frank Castle get injured and Karen Page call in Claire to patch him up and make vague allusions to all the other people she does this for. That’ll be a first for this universe, but at least it won’t be as repetitive as her other appearances.